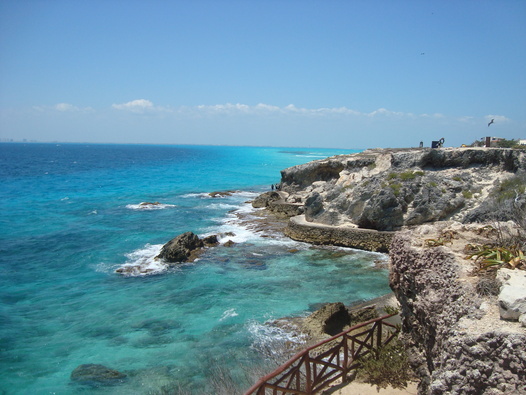 The east side of the point is Acontilado del Amanacer, “The Cliff of the Dawn”. This is the easternmost point of Mexico, so if you are standing on this point at dawn, you are the first to see the sunrise in Mexico. (Standing there at sundown isn’t as certain a distinction, since anybody in deep canyon on the mainland might see the sun set before you do). Joggling down to the point is about all that I can do now that my shoulder has these stitches in it. The local medicos seem to be of the opinion that I shouldn’t swim as long as I have these stitches (I say “seem to be of the opinion”, since there is a language difficulty, and also they seem to not have the same notion – every day when I get the dressing changed, they do it in a different way).So my vacation has become a bit of a bore – there’s nothing for me to do. When I was sliding along the asphalt coming off the moto the other day, I remember wondering what the effects of the wreck would be (while the wreck was still in progress). That was a case where the wreck itself was brief, but the consequences started immediately. Currently, my life is exhibiting a different type of wreck – a train wreck. A train wreck is different from other wrecks in that, when the locomotive has stopped, it still takes a long time for the rest of the cars to derail and pile up – you don’t know how extensive the damage will be until all of the cars stop moving. This is the sort of thing that happens to folks who hit a sudden life-changing event that drives them into AA – they come in and get sober, but the consequences of their actions may not even finish showing up for months or years. Ruined marriages or businesses, financial or legal troubles may not even present themselves until long after the events that precipitated them have occurred. My current train wreck is the result of my having changed jobs almost two years ago at Go Daddy. That decision resulted in the locomotive going off the rails about six weeks ago, when I lost my job. Ouch. We were selling our home in Arizona; we hadn’t been sure about that, but when it seemed obvious that I might be losing my job, we went ahead and put it on the market. That, combined with taking a job out of state, meant that we no longer lived in the city with my two sons and their families. Oh, wow – we lost our home group of eight yeas in Anthem, and the fellowship with those friends, and I lost my own group of eight years in Scottsdale, and who knows when I’ll see those folks again. Also gone is our home-away-from-home group in Durango and our membership at the Hillcrest Golf Club, playing eighteen holes surrounded by mountain peaks at 80 degree temps in the summer. Since we both telecommuted, we had plans about a Mexican beach house someday – actually, maybe not too far away. So I was studying Spanish consistently. Now that’s gone, and I can’t get up the gumption to even finish the five levels of my Rosetta Stone. And there were a lot of options left on the table at Go Daddy; that was my “gonna be rich some day” pot at the end of the rainbow. That’s the sort of thing that lives at the back of one’s mind until it is gone, and then it suddenly comes to the forefront of one’s consciousness. These are the cars of the train wreck; new things crash into my awareness that are the result of that decision two years ago that caused the loss of the job six weeks ago. Now, I am aware that God is running my life. I believe that what He has planned for me is better than what I could plan for myself. I have a faith that rings true telling me that the things that are gone are not as good as the things that He has in front of me. And I’m also aware that I was not happy in my previous job, and I have every reason to believe that the new job is going to be a much better fit, and I’m excited about the job, the training, and the people that I will be working with. And I know that my new employer (the temporal one, not the Eternal one 🙂 is a great company to work for, and who knows what will happen down the road? But I have to let go of the things that I have “lost”, and I can’t even know that I have LOST them until I become aware of the changes. So nice to be able to read how you are doing. I attended the Scottsdale group one Monday or Wednesday night in July; meeting up with another friend and hoping to see you. I heard through a friend that you were going through some changes related to your job. I’m glad to know you and “Ethel” are doing well (despite your recent accident). It reminded me of a saying my mother gave me years ago….God didn’t promise us easy sailing but He promised us a smooth landing. Sounds like you have lots to be grateful for but no doubt you’ll be missed in these parts. More work to be done and more people to inspire with your wisdom, recovery and faith. Being willing to carry the message and being willing to say yes is not always easy but it is the actions we take in order to show the gratitude we have for what we have been given. And it is no doubt all a gift. God bless you. So great to hear from you, Judy! Best blog post I’ve read all day. Everybody who works at WD is an evangelist for the company. Kinda reminds me of an internet start-up I went to work for some time back : ) …that place has changed now (at least for me) but I’m looking forward to the new adventure.